One of our customers has extra toddler bibs (made of flannel and hemstitched) that are ready to have a beautiful crocheted edging added. The price is $5.00 each. If you are interested, please call Trish Ziegler at 916-549-7976. Sundress Quilt. "The most important thing in a dress is the woman wearing it." That's the theme of this Crabapple Hill Studio quilt. 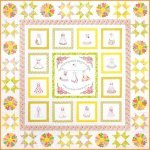 The 64-1/2 square quilt features 13 blocks of embroidered sundresses and a pieced border with Dresden plates and star blocks. Beth made hers using the "Forever Love" fabrics by Eleanor Burns, and it's beautiful! Beth Kondoleon, 1st Saturday beginning Feb 4, 2017, 9:00 a.m. - noon, $120 for 6 sessions, supply list. Students must purchase pattern. Foundation Paper Piecing BOM. Have you always wanted to try Foundation Paper Piecing but did not know where or how to start? If so, then this Block of the Month is the class for you. In this class we will begin with the simpler blocks to get your feet wet and progressively get to the more complicated blocks. By the end of 2017 you will have a beautifully pieced quilt, a quilt to cherish for years and years, and a great understanding of foundation paper piecing as well. Foundation Paper Piecing is very accurate, very addictive, and a very fun way to quilt. Come and join Dana and she will show you all the tips and tricks. 3rd Tue beginning Feb 21, 2017, 5:30 - 8:30 p.m., -OR- 4th Wed beginning Feb 22, 5:30 - 8:30 p.m., Dana Lahargoue, $20/class. Students must pay for 3 sessions at a time ($60). Tuffet Class. Tuffets are all the rage! They can be whimsical, elegant, scrappy, or made to match any room. This is a 2-session workshop, and you'll have a completed tuffet at the end of the class! Session 1 is sewing and learning the technique to make the foundation pieced Tuffet cover. Covers are finished at home prior to Session 2. In Session 2, we assemble the upholstered form. The instructor will bring the tools needed for construction. Tuffeteers can purchase one of the instructor's finishing kits ($125) or gather the materials themselves. Pattern purchase is required ($28). You must be an intermediate quilter/sewer and have a good working knowledge of your sewing machine. 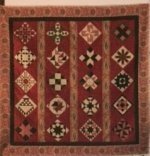 Jill Schlageter, Wed, Apr 12 & 26, 10:30 a.m. - 1:30 p.m., $60, supply list (pattern required for class). Needle-turn Applique (Beginning). Using Angela Lawrence's new book, you will make a beautiful wall hanging and learn several different needle-turn applique techniques. At the end of the class, you'll have a beautiful piece to hang in your home and have learned many new skills. Judy Cummings, 4th Tue, 9:00 a.m. - noon, Mar-May, 2017, supply list, $60 (for 3 sessions). Woodland Playhouse. 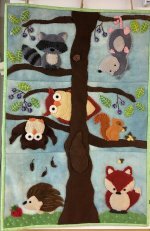 Robyn designed this whimsical wall hanging. It's made of wool with fun embellishments and would look adorable in a nursery or a child's room. Robyn Babb, 3rd Sunday, 11:00 a.m. - 4:00 p.m., starting 5/21/17. $30/session. Students must pay for the first four sessions to enroll. Patterns will be distributed in class ($5 each month). Supply list. We have more new solids, new batiks from Hoffman, and several new Kaffe Collective prints. We also have Hoffman's digital Skylines print back in stock and more digital prints from Red Rooster's Whispers collection. Come in and see them!